The value of any kind of travel narrative is meted out not in the immediate present but slowly over time, which only adds to the torture of writing them. Oftentimes both reader and writer don’t really know what they’ve really got on their hands until five, ten, or even fifteen years down the proverbial road following the book’s publication. That’s when you can take a hard look and see what of the author’s words still hold true — which of the observations were so prescient back then that they were not only true at the time they were written but were even prophetic, wholly or partially. That’s when you get a true sense of the value of the thing. The travel narrative that jibes only with the current reality is nearly useless. By the time it goes to print it’s half out of date already. The one whose prose casts an eye, intentionally or not, on the future, the past, and the present — that’s what the travel writers of the world are all aspiring to, and what so few actually achieve. 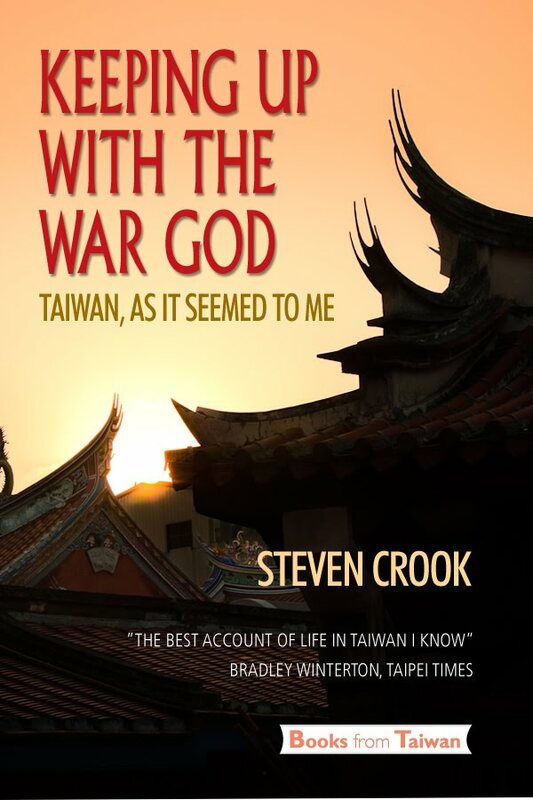 Steven Crook would, I suppose, now qualify as one of Taiwan’s old foreign hands. He has been writing about the island nation for newspapers, magazines, and guidebooks since 1996, nigh on twenty years now. His book, Keeping Up with the War God, came out in 2001, when he wasn’t yet an old hand. But he was already writing like one. 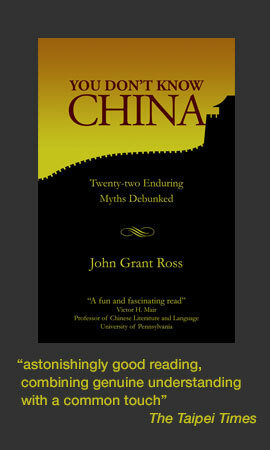 The book is acerbic at times, but without the commonplace white Western expat in Asia whinging. You know the kind. The type of writing that bemoans the backwards ways of the local population, cringing at the strangeness of the customs, and cracking wise at tradition. No, this is far, far from any of that, thank goodness. It is forthright, no doubt; but even in moments where his wit — and there is plenty to spread amongst the pages — takes a turn for the acidic, Crook never allows it to overshadow his love for this place or his fascination with its cultural and customary idiosyncrasies. 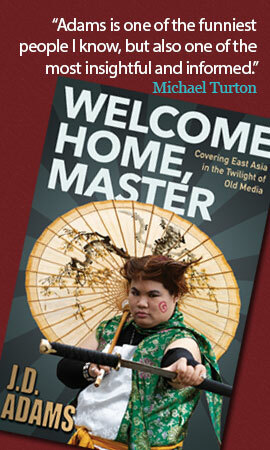 Nor does he let his passion for Taiwan cloud his judgment and turn him into some kind of cultural apologist. Fundamentally, Crook is fastidiously honest in his explorations of place, time, and culture as they relate to Taiwan. He offers no caveats, for none are required. He makes no apologies, for he owes none. As the subtitle of the book says, he simply presents Taiwan “As It Seemed to Me.” The true wonder of the book is that often the way it seemed to him in 2001 is the way it still seems today in the latter stages of 2015. In one passage, he remarks on Taiwan’s high level of public safety and ludicrously low crime rate, tempering those observations by stating that although it does seem unlikely one will fall victim to violent crime while in Taiwan, one could very well be killed by way of neglect, say, of the common rules of the road for instance. 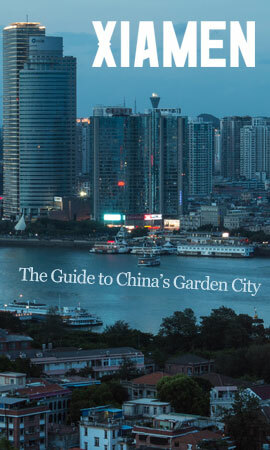 Crook doesn’t pull punches in his descriptions of his wanderings throughout the Taiwanese countryside and cities. Chiayi is described as a place that will never be anything more than a city he passes through. Nor is he fearful of skewering sacred cows. The most obvious example would be in his writings on Ali Shan, a heavily promoted mountain destination featured prominently in Tourism Bureau propaganda. Clearly unimpressed, Crook describes the place as a car park surrounded by hotels and overpriced restaurants. The best way to sum up Keeping Up with the War God is to say that Crook is a master observer of, as he puts it, “the confluence of the sacred and the profane.” His historical knowledge and the depth of his research into the work is unimpeachable, digging far below the cursory and the obvious to the strange and, in terms of broadly read or available English language literature, the unknown. From pirates in Chiayi to a shrine dedicated to a faithful guard dog put down by poison fed to him by a gang of marauding bandits, Crook provides healthy doses of uncommon perspective throughout. In the years that have followed the publication of this work, Crook has established himself as one of the preeminent foreign experts on this land, a testament to his dedication to exploration of all corners, from the truly wondrous to the over-hyped; and he portrays them in his highly descriptive style in the manner they deserve. At no point does Crook’s passion or his brutal honesty wane, nor does his enthusiasm for this place falter. As he writes in the closing, “there is always some other spectacle,” and we hope he will be there as its chronicler. 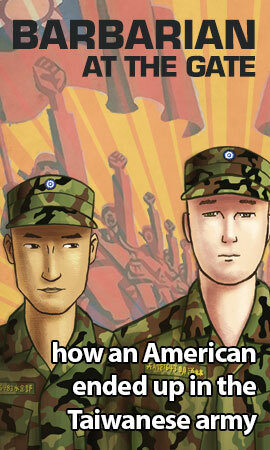 Joe Henley is the author of Sons of the Republic, a tense thriller centered around a China–Taiwan conflict.